Just so that we are aware of the difference between child care centres and other kindies, enrichment centres etc. (1) That the government is subsidizing fees for CHILD CARE for working mothers. A child-care centre is licensed and must operate from 7 am to 7 pm (full day) and also open on Saturdays (7 am to 1 pm). These centres are mainly to cater for working parents who NEED to have somebody look after their kid for whole day and there must be meals provided. 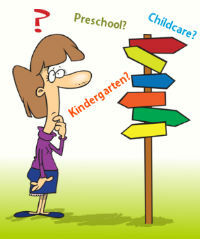 (2) Kindergartens and other enrichment centres not registered as "child care centres" has no such constraints. Kindergartens who are MOE registered followed MOE guidelines of course. They usually operates 3 hours classes for pre-Nursery, Nursery, K1 & K2. The school fees are NOT subsidized! So the first question you need to ask yourself is: Do you require a child care centre who will provide long hours of care, provide meals and bathing for your child? You can also choose to put your child into a half-day child care centre. Most of the activities and learning will be done in the morning. If you do this, the half-day childcare centre fees after government subsidy can be a lot cheaper! For full day childcare centres, in the afternoon some have lessons, some have enrichments tied-up with external vendors, some have in-house cookery sessions conducted by own teachers, some watch TV! That’s where the standards differs and really you need to look for one time-table that you like. Then you need to ask yourself: Do you want a very academic pre-school kindergarten or a more relaxed, more all-rounded cirriculum? After much consideration, I decided to go for a church-based kindergarten with more fun, more physically mobile, more hands-on kind of cirriculum for my DS. Welcome to KSP! Hey, I saw that your DD’s birthday is just 3 days before my DS leh! Same golden pig year too? So still looking around, not yet started her or registered for Nursery next year? For me, I think if work part-time, even more "fen xing" (split heart). In the end may not be worth-while especially got small kids and may find that even the 3 1/2 days per week to be stress-ful. May be better to do full-time and enjoy all the benefits of medical and leave or quit altogether to concentrate on home. For your case, sounds like you already know what to do and husband supportive so very good! For me, I am definitely better off working full-time and try my best to spend whatever non-work time with my boy! Thanks desertwind for yr encouraging words. It’s true, seem harder to be a parent nowadays. So many decisions. Maybe also because we have so many choices! our expectations are higher, society is more competitive, things are more expensive, and we worry about our kids’ future. It’s a struggle! I did consider working part time to spend more time with my boy. I know myself, cannot be full time SAHM. But part time yes, I would love that. I’m lucky as hubby is supportive but I know it will be stressful for him with the cut in income. So we discussed and think maybe I’ll do that when we have no. 2. In the meantime I’ll continue to work and try to save more. My friend has 2 kids, thinking of trying for no. 3 and she struggles every day with the decision whether to quit her job or not. Her boss agreed to let her work 3.5 days per week. But she ends up doing some work at home and is often tired and stressed. Now she doesn’t know if it’s a good thing or not! When DD turned 2, we sent her to a half day CC so that my DW (SAHM) will have more time with the household chores. DD ended up being sick every other week. We found out that it’s because CC caters to working parents and have nobody at home to take care of the children. So even if the child is sick, he will still be sent to the CC. In fact, we observed that the CC has a push cart loaded with bottles of medicine, and the teacher will go round administering medicine to the sick children, much like a nurse does in the hospital! We pulled DD out after half a year and put her in a 2-hour playgroup/kindy instead. She hardly fell sick after that. So you might want to take this into consideration when choosing CC or kindy for your child. Sometimes I wonder how the centres go about determining how much to charge? And I suspect they charge to the max. to make full use of the subsidy and ended up parents do not pay any cheaper. The head told me that since after subsidy the fees we pay is the same at SGD600, why not I choose the full day to have more value? I was like ? Doesn’t seem equitable, why don’t they just price it such that there is a difference and that I can understand? Which is why I suspect they price the fees to the max to benefit themselves not parents. With kindies, so far the fees per term are pretty stable and seems reasonable even with the inflation in recent years…..
Hi Desertwind, thanks for sharing your knowledge. Just a point though that there is actually not much difference in fees if one choose a half day care vs full day care program at most childcare centres. For instance, the fee for full day care compared to half day care at the childcare centre my ds goes to is less than $50 difference. Childcare centre usually charges more than half (as much as 75%) the fee of full day care program for half day care program (eg. $750 for FD, $550 for HD) but govt. subsidy is halved between the 2 ie. $300 for FD, $150 for HD. Glad to know my article is of some help! As a parent of a very young child myself (3 yo), there is much to learn as we go along…. Full-day childcare has its benefits as I have often heard from my colleagues and also my brother that the kids learn a lot, became more independant and speak up much more! It aids in their language development too so don’t feel too bad about it so long as the kid is happy and developing well in his developmental milestones! * To work or not to work? * To put into childcare half-day or full-day? * To rely on maid or not to rely on maid? * To take school bus or not to take school bus? etc…etc…. For me, I also cannot bear to put my boy into full-day child care centre and the alternative is to rely on my maid! Is this the ideal situation? Certainly not you may say, because we all heard enough about maids. But for me, I have no choice – or I should say I have made my choice ie. put for half-day and rely on maid the other half. Thanks desertwind! i was trying to explain to some friends (new mums n dads) over the weekend about the difference between childcare, kindy n enrichment. They seemed less confused after that – at least i hope so!! I think i’ll forward them yr blog entry, cos it’s really helpful! I was lucky to have my parents look after my boy till he was 3. Then hubby and i decided to choose either kindy or childcare for him cos it was getting too tiring for my parents to keep him entertained all day, since my dad’s health not so gd now. We also felt it would be better for him to learn in a proper school setting and interact with other kids. So now he’s attending childcare n i feel it has made him more independent n confident. You are a wonderful mummy, may your wish be fulfilled! Thank you for sharing DesertWind. Ver insightful and detailed. I Q-ed for DD’s kindy right after she was born (3 days young) I intend to send her for nursery then onward to kindergarten. Yah, we all learn hor? It was a very painful lesson for me because I just "chucked" my DS from 2 yo to a nearest CCC for about 6 months and he did not enjoy it at all. At the end of it got a shock when teachers told us he could not pay attention and they could not get his attention/eye-contact! Hence at that time I "woke up" and scrambled to go hunting and looking for a pre-school around my area and my friend too was helping me. Me & hubby took care not to buy in too much to those "sales talk" or "fantastic time-table" or "beautiful artworks by the kids" but really to observe all aspects to see if our kid will be able to fit in. In the end, the result is both hubby & myself decided not to be too adventurous in this aspect and go for a tried & tested traditional church kindy! Really happy to hear that your child is doing well in the church kindy and enjoys going to school everyday! You know, when I was searching for a presch for my DS, I too was confused at the various ‘categories’ of pre-schs and wondered the rationale behind the fee charges ie full day, holidays, even though if for instance, he would not be attending classes during the sch break. So naive hor …. Guess what I did, I invited a friend, who is a P of a reputable presch/childcare centre over for lunch and got her to clarify my queries I mean, at that point of time for instance, I saw no sense in paying $800/$900 for a 3 hr class even though it was a full day presch. But now I now better. In the end, I too chose to send my DS to a church run, albeit small kindy last term. Suffice to say, he is very very happy there and looks forward to school every day.